Not all growing containers are equal. Some types of containers are better suited for some purposes than others. Likewise, growing pots don’t just differ in size. You can find containers from the classic flower pot to advanced smart pots or specialty containers for hydro systems. Learn what you need to know about growing containers for weed. Selecting the optimal growing containers for weed isn’t always easy and straight forward. While you may be able to get by with the ol’ flower pot for your first grow, you want to choose the right growing containers, that provide for optimal growth and healthy plants. Let us take a look at the various types of growing containers available along with their differences, advantages and drawbacks. If we were to simplify things a bit, the optimal growing containers for your weed plants would be those types of pots, that will provide your plants with the best possible environment for their roots. Healthy roots are essential for optimal nutrition and water intake and quite literally are the foundation for the healthy growth of your plants. The roots of your cannabis plants should never entirely dry out, since dried-out roots mean, that your plants would likely die. Roots will also want adequate aeration and oxygen. When the roots have easy access to oxygen, this not only promotes fast growth, but will also help keeping mould and other growing troubles in check. A stale root zone depleted of oxygen will almost always lead to problems, if not entirely kill off your plants. If you visit a grow store or search around online to get some pots on the internet, you can find various types of containers for cannabis growing. Here are some of the most common types of growing pots. This is the good ol’ flower pot, that you can get almost everywhere for little money. They are most often made from plastic these days, but you can also find the old classic types, which are made from terracotta. If you get these standard flower pots, you will usually want to get them together with a matching saucer, that serves to catch your runoff water below the pot. What’s important to know about these types of pots, is that you want them to have drainage holes at the bottom to avoid water logging. Not all pots come with prebored holes, sometimes you will have to break them out, before you use the containers to grow your plants. Terracotta planters are heavier than plastic pots, but they can be a good choice. Terracotta has a natural ability to soak up and store excess moisture and can provide a cooling effect, which would benefit your plant’s roots in the hot summer months. The principle behind fabric pots, these so called “smart pots”, is to prevent, that your plants would become rootbound. Rather than growing in a cycle as would be the case in normal (closed) pots, smart pots made from fabric are air-pruning the roots as soon as they reach the sides of the container. 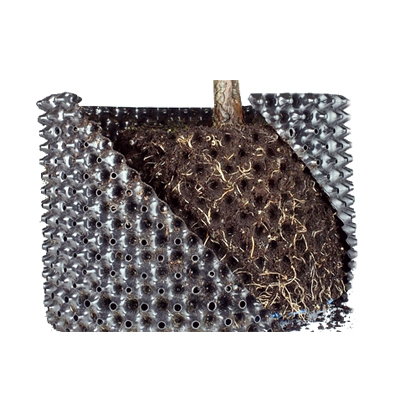 This ensures constant new growth of roots and can help promote better plant growth. 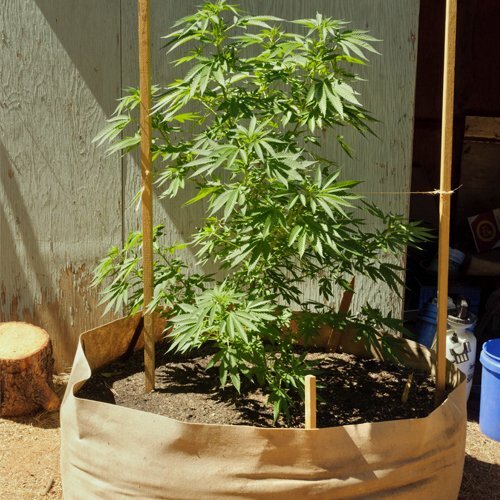 Fabric growing pots or bags have the added advantage, that they make it pretty much impossible to overwater a cannabis plant. They can also easily be stored when not in use. Make note, that the soil in smart pots dries out faster when compared to standard pots. To avoid the smart pots drying out too fast, you want to get double the size pots as you normally would. Of course this comes with the slight drawback, that you will require a bigger amount of growing medium. Since these types of pots leak water to the outside, they may not be suitable for all growing environments. Air pots make use of the same principles as the above mentioned “smart” pots. These are plastic containers with openings on the side, that provide automated “air-pruning” for the roots of your cannabis plant. Like smart pots, you will have to water more often, since these pots can dry out faster as compared to standard pots. Compared to fabric pots and grow bags, air pots have the advantage, that they are sturdier and won’t likely tip over. Since air pots are also leaking water from the openings at the side, you may want to set them above properly sized saucers. Hempy buckets are providing a type of manual hydroponic system for growing cannabis plants. The difference to normal pots is, that the drainage hole isn’t at the bottom, but several centimetres above, which leaves a small reservoir of nutrient solution at the bottom of the hempy bucket. As compared to soil grows, you would normally fill the hempy bucket with a mix of perlite and vermiculite or use clay pebbles and then feed the plants with hydroponic nutrients. 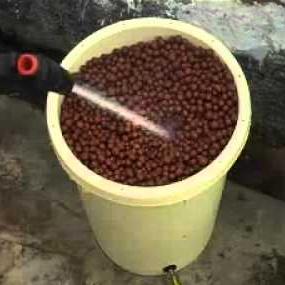 The nutrient reservoir at the bottom of the bucket means, that you can water less frequently. Since hempy buckets are a manual and passive way of hydroponic growing with no pumps for oxygen, you need to ensure, that the nutrient solution left in the pot won’t become stagnant, since this could lead to growing troubles. Since you don’t want runoff water flooding your entire growing area, you want saucers placed under your pots. Normally, you would have a matching saucer for each of your growing containers. Some types of growing containers like smart pots or air pots will require much bigger saucers, since excess water will flow down the sides when watering. Take this into account. Most cannabis growers will likely get into a routine of frequently emptying out their saucers. This isn’t much of a problem if your plants are still small and you can easily access any pot in your growing area. Sometimes, in particular when your plants have grown taller, reaching to each and every pot and removing the saucers can become quite a chore, if not entirely impossible due to space constraints. One solution for this problem can be if you use large trays underneath a number of growing pots as opposed to smaller, individual saucers under each. If you set this large runoff tray on a small incline, the water will usually collect in one space and you can then easily remove it with a shop vac. Another more advanced solution can be with an automated pump, that can take care of the runoff water, that will collect in your tray. Not all cannabis plants require the same size of growing containers. Some plants, for example autoflowering varieties, are not growing too tall and can do well in smaller or medium sized containers. When you select the size of your growing pot, consider the final size of your cannabis plant. As a first starting point for selecting the right size pots, you can use pot sizes of approximately 7.5l for each 30cm of plant height. Just know, that not all cannabis varieties grow in the same way. Some strains can grow wide and bushy, while others can grow tall and slender, but this rule can help you get started finding the right sized pot. The same principles for healthy growth will apply for smaller containers for your seedlings. You need to ensure proper drainage for your seedlings as well. Since pots for seedlings can be very small and don’t hold too much growing medium, the soil dries out quicker, which means, that the risk of overwatering is lower. Many cannabis growers use solo cups (“party cups”) for their seedlings without problems. Just make sure to cut drainage holes in the bottom of the cup. 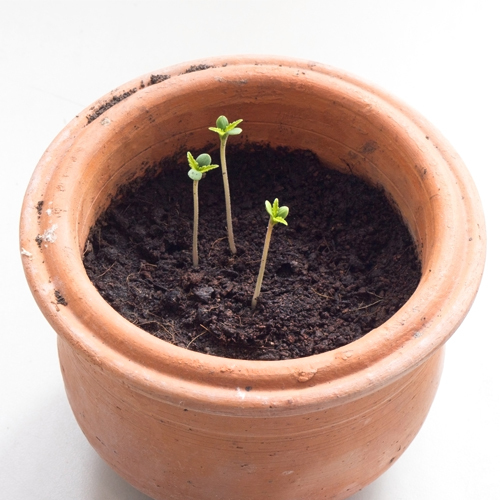 Not always can it be recommended to start out cannabis plants in a small pot or cup and then transplant them later. Any repotting will always cause some stress to your plants, that you want to avoid. For autoflowering varieties, that by their nature have a preset and rather short life cycle, it can often be best to start these plants in their final container. The reasoning here is, that you want to avoid any stunted and halted growth from repotting during their short growing life cycle if you want to max out your plant's growth and yield. Most of the time (with some exceptions as mentioned above) you will likely start out your seedlings or clones in small containers and transplant them to bigger pots when the right time has come. The reason here is, that a bigger container allows for a larger root system, that your now rather grown-up cannabis plant will require to get all her nutrients. Transplanting on the other hand can always cause some stress for your plants and if not done carefully, could even kill your plant, say, should you damage the roots when transplanting. It is therefore important, that you move your plants, so that you don’t disrupt their roots in any way. The best time to transplant is when your cannabis plant has developed a vast root system, but is not rootbound in the pot yet. Normally, the right time for a transplant is when your plant’s roots would show through the holes of your pot, as if they were searching for more room to grow. You want to avoid the plant having become completely rootbound though. Carefully take out the plant from the first pot and try not to disturb the roots. In the bigger pot, make a hole in the middle of the growing medium where you carefully place the plant. Fill any remaining gaps in the new pot up with soil or whatever growing medium you are using. When you transplant your seedlings, the best time for larger ports is usually when the seedlings have grown 3-4 sets of leaves. If you want to avoid any type of potential growing troubles and want to keep it on the safe side, simply skip transplanting altogether and start your plants in their final pots. Your plants may start out slower than if you were to start them in smaller pots, but the reduced risk and then the less work from transplanting can be worth it, especially for less experienced growers.